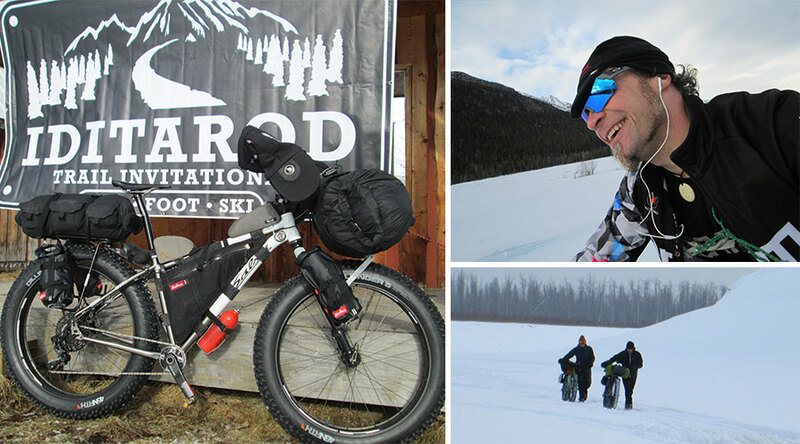 We asked Facebook fans to ASK JAYP any questions they had for him after returning from his 1000 mile ride on the Iditarod Trail. After quite the journey with mixed conditions and an extended amount of time at -40*, he crossed the Nome finish line sharing first place with friend and fellow competitor, Jeff Oatley, showing unbelievable sportsmanship and that racing is more than just a result. Here is Part 1 of JayP’s answers to your questions! Q: My question is how do you mentally prepare yourself to push your bike for days on end when there is no trail put in and it's -40 outside? Q: What do you think of to keep yourself going when self doubt creeps in? Seems like the endless miles of the TD or ITI can wear down even the toughest individuals. Q: Describe for me the most transformative or “out-of-body” moment you had on the trail during this most-recent adventure. Q: Have you ever just said “Enough, I don't want to do this event” and bailed? Q: Are these adventures part of an inner search? are you hoping to find answers to something by enduring? or have you learned anything? I’ve lumped the above questions together as they seem to be all related to the mental aspect of these adventures for me. In my opinion the mental side of any multi­day endurance event is the most important. Physical ability will only take you so far, but your mental ability will take you further. It takes a certain person and personality to push through challenging situations, and it’s our mental attitude that gets us there. I believe the more experiences we have, the stronger you will get mentally and I’ve got about 20 years of experiences! There is an actual finish line to every start line when it comes to an event. When I put my wheel on one of those start lines, my brain is programmed to not stop until the finish. No matter what it takes, as long as I am not jeopardizing my long term health or doing permanent damage to myself, I will get to that finish. I often say I do not understand or comprehend the word ‘quit’ ­ it’s just not an option; it’s not in my vocabulary. Events like the ITI are mostly adventures, journeys if you will, not bike races. So, if confronted with walking, pushing and/or carrying my bike for miles or even days at a time due to terrain, that is what I’ll do! There is nothing wrong with being a “fair weather” rider, but when it comes to winter travel and being in an event, you don’t really have a choice. It’s one of those “it is what it is” scenarios. I have learned not to complain about anything, trying to embrace it all, turning negatives into positives, always talking about the upside, or just stating “sooner or later it will get better.” In general when things are bad, they can only get better, so there is something to look forward to. It all has to do with ‘time’. It’s the only constant we have, and no matter what you are doing in that ‘time,' it is all going by the same. So you might as well do something productive or beneficial with your time. There is a huge amount of commitment when it comes to preparing and getting to these events, and it takes a lot of time. To me, there is only one thing to do during my time in a race, and that is ‘move forward’ until you get to the finish. Have I ever bailed from an event? I did once, and learned A LOT from it. It was my first attempt at getting to Nome, the full distance Iditarod Trail of about 1000 miles. I actually won the race to McGrath that year (350 miles) and then pushed my bike for a week after that. I was sick (drank overflow and got giardia), someone else I was with quit, I was influenced by some locals that said I would never make it, and the trail was only going to get worse. I was just surrounded by negative energy. I phoned some friends and my wife looking for advice and support. In the end I was told it would be OK if I stopped­ that was what I didn't need to hear. I learned from that, and I just needed some of that ‘time’ I spoke about earlier to recover mentally and physically. There is just enough to do to keep me busy on the trail. I have a mental checklist that I am constantly going through in my brain. Am I drinking enough? Am I eating enough calories? Is my air pressure correct? I think about the #’s; time, mileage? I make small goals trying to get to the next cabin, shelter,­ sometimes it’s just getting to as far as I can see up the trail. Do I need to work on my sweat management? There is so much to take in / think about while looking around, taking care of myself and bike, and realizing how lucky I am. When my mind is really worn out and I am just plodding along, I may put music in my ears to distract me or pass time -­ music is a tool! Why? That is a pretty big common question. I am constantly looking to figure things out to make these types of trips easier and more enjoyable. This has little to do with equipment and a lot to do with my attitude. There was a time I would question myself on the trail; I no longer do that. I live in the moment and I am always curious how far I can push myself, what I can ultimately endure. This is kind of scary to me when I think about it as I been doing this for so long. When will I ever get to that point that I feel I pushed myself far enough? I just don’t know, as I haven't been there yet. Tears? Heck ya, I am human, I have feelings and I am emotional. I shed tears almost daily. More so as mental fatigue sets in and after I settle in which takes 3-­4 days in itself. A lot of days it is from the appreciation of feeling how lucky I am. I get these overpowering, empowering feelings of being overwhelmed at what I am able to do. It is this crazy inside feeling of power and humility. I start to feel like I am unstoppable, nothing can get in my way. Not in a tough guy type of way but in an amazing way that nothing else matters, I can do anything I want, and I am lucky to be able to do that. I think about my past, my wife, my family and that also makes me shed tears. At each finish, I also shed tears in celebration and sadness as another journey has come to an end. I feel very relieved and happy when I do shed those tears. I am just human! Q: What's the diet like? Everything in sight or well balanced meals? It’s all about A LOT of calories. I pay most attention to fat, carbs and protein. I personally can’t afford to lose weight, and since fat is the first to be burned, which I don’t have much of, I need to take in as much as possible. I lost over 10 lbs. this year. I describe my diet as ‘trail food’ and ‘meals’. Trail food or quick calories, as I also might call them, as I never stop to eat this stuff while on the trail. I dig in, unwrap, stuff in my mouth all while still moving forward. These calories are a combination of things like chocolate, nuts, Kate’s Bars, pastries, cookies, chips, trail mix, M&Ms of all varieties, etc. A good mix of sweet and salty as well as balancing things that are easy to chew and swallow. Meals are for before sleep, when I wake and sometimes mid­day when I know it is going to be a long leg before next resupply or shelter. They consist of Ramen to which I always add protein such as sardines, tuna, dried meat or Spam. I also eat freeze dried meals, oatmeal, instant potatoes and other ‘just add water’ type of stuff. I also put a stick of butter in every food drop and add it to my meals, oatmeal and hot chocolate. Remember food freezes, so if it is an item I know will be tough to chew if it gets cold, I will rotate it into a pocket close to my body to gain some heat and stay soft or manipulate it in my glove or pogie for a bit before eating it. The more time I spend on the trail the more barbaric I feel when it comes to eating. I get to a point I just want to eat everything I see! I actually have to be careful because when I get my food drop, I immediately start pigging out but need to make sure I save enough calories for the next leg of trail, until my next food drop. Another odd thing that happens after about 4­-5 days on the trail is once a day I go through this period of time where I am eating every few minutes. I just can't stop thinking about food and must eat. It’s partially in my head, but it’s also my body having this huge craving for calories. This can last an hour or two. It’s another time I need to be careful as I can easily eat most of what I am carrying in that time. This year with the extreme cold and slow moving trail time I was forced to ration my food. I often ended up in the next village with no food or water left. I feel I was eating more this year than I ever have in the past. I am blaming that on the cold but also taking care of myself properly, as I felt pretty good the whole race and got stronger in the last 3-­4 days. Q: ­ What advice would you give someone that wanted to try and endurance race for the first time in their 50’s? First of all, don’t let age get in your way. Look at the demographics of the people in these events, there are plenty over 50, and they are all amazing athletes. I wouldn't give a 50-year-­old any different advice than a 20­-year­-old. But I will say a 50­-year-­old is much more mature and already has a life of experiences that can be pulled from. A 50­-year­-old's mental attitude is more than likely already where it needs to be, and one would just need to be fit with a small bit of experience and a lot of desire to finish any endurance event. And it is always easier when you enjoy it, embrace it, and do what works for you! Q: How does an average person effectively and safely prepare for terrain and conditions that are nowhere near where they live? A little bit of research will give one an idea of what to expect. From there you can start to think about those conditions while training and preparing in your own area. I generally always think of the extreme or worst case scenario and prepare for it. I know of many people that do, have done, the ITI and do not even live in snow country. So, there really is no excuse, and one can always take a trip or do another event on a smaller scale in a similar area to gain some experience. In fact, I highly recommend that you test drive your fitness and systems in a shorter event before taking on the Iditarod, which you have to qualify for anyway. Q: ­ What is the closest to death you have been out in these cold races? WOW…death. Hmmm, I was really scared once. I was with Tracey, and we were on the Yukon River. We had some monster days already and were dealing with ­-20* for several days. We were on a 24­hour push to get to another village. It was late in the night, dark, and I was all bundled up. Something in my head triggered something, I don’t know what it was, but I was also very cold. I looked at my thermometer and it was reading -­40*, the lowest it reads. (A village resident later told me it was ­-50*.) All of a sudden I just started running; I remember this scared feeling. I did not stop running for a few hours until I got to that village. I kept looking back to make sure I could see Tracey’s light. She was also running and experiencing something very similar. When I got to the river bank, a native was standing there waiting to take us into his house. He knew something was up as he was staring out his window down the river and had seen our lights hours earlier. It’s kind of neat as there is so much respect for the weather out there, and everyone seems to keep an eye on each other when it is that extreme. It was the only time I ever felt like there was someone else in my brain telling me what to do. I guess that’s the survival part of the brain that we don’t often get to experience, but I'm glad we have it. Q: What personal safety rules do you refuse to compromise on (for the sake of gaining progress) when the going gets rough? 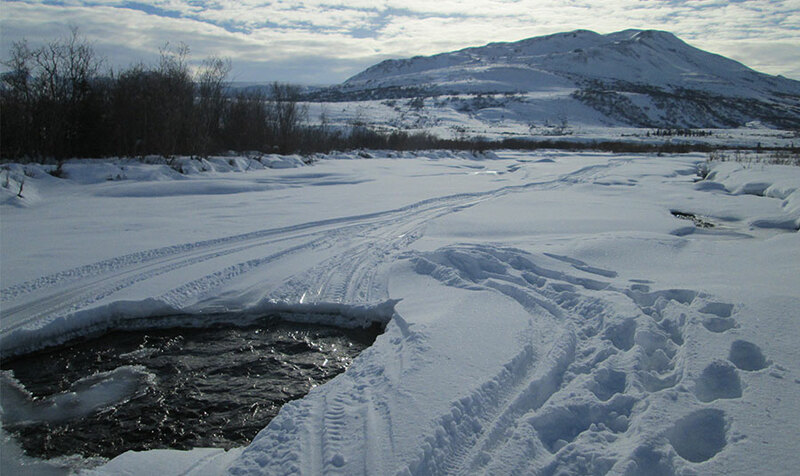 The result can be too serious to compromise on safety when going to Nome on the Iditarod Trail. I may do things that seem unsafe to others, but I obviously am OK with it. What is safe to one might be unsafe to another. In the end unsafe practices are just bad decisions. You don’t gain progress on compromised safety as accidents do happen and they are just not worth it!